Central vacuum systems have been around for quite some time, now they’re getting a lot of attention from custom integrators. Why is that? Integrators, like other business owners, want to increase their revenue and their profits. They’ve seen significant declines in their margins for flat screens and other electronics in recent years and are looking to replace that revenue. Adding central vacuum systems is an excellent, profitable solution. Our BEAM products deliver margins of 50 percent or more. Integrators who offer them also have a competitive advantage in pursuing business with builders and remodelers who want their subcontractors to be able to install a full line of home electronics systems including central vacuums. What technological advances have been made to these systems over the last several years? Central vacuum systems today are quieter, more powerful and offer more convenience to the homeowner than ever before. Our new BEAM Alliance System, for example, is so quiet you can clean the home without interrupting other family activities. It also includes two-way communication between the power unit and the hose handle that keeps the user informed about the system’s performance and when to empty the collection bucket. We’ve also designed the system so the user can reduce power for cleaning drapes and delicate items. Explain the market forces that are influencing both customer and integrator acceptance and demand for central vacuums. Clearly, residential construction is coming back and the demand for new homes is the highest its has been since 2007. Approximately 25 percent of luxury homes are now equipped with built-in central vacuum systems and the penetration is rising rapidly in move-up homes as well. These homes are being purchased by buyers who want technology in the home and built-in convenience. Secondly, consumers are insisting on healthier home environments in addition to homes that are energy efficient. Using a central vacuum system improves the indoor air quality of a home by completely removing contacted dirt and allergens from the living space. Our BEAM systems have been proven in a clinical study to reduce allergy symptoms up to 61 percent. Our new Alliance System includes two levels of HEPA filtration to assure that none of the captured allergens can re-enter the living space. Another market force is the desire of homeowners to maximize the value of their homes. Appraisers have said that a central vacuum system can increase the value of a home by as much as $2,500 – more than the cost of a system. The National Association of Realtors says that a home with a central vacuum typically sells faster or sells for a higher price than a similar home without one. Many of the integrators who sell BEAM Systems tell us our systems also protect their customers’ other electronic equipment because they remove dust that can damage electronic equipment over time. What would you say to an integrator who may be concerned that installing a system might be difficult? Electrolux Central Vacuum Systems offers a number of programs to support our installing BEAM dealers. At the top of the list is installation training. Installing a central vacuum system is not difficult. Through our training, the integrators see how many of the skills they have developed to install other systems are very similar to installing central vacuum system inlets and tubing. A two-person installation crew can rough in the tubing and inlet valves in a new home in few hours. They can install a complete system in an existing home in less than a day. Give us a quick idea on the process, tools and skills required for an integrator to retrofit a central vacuum system in a client’s 2 story home. Planning the system installation is critical. You’ll want to determine where to run a horizontal tube and wiring between lower level floor joists or through the attic that connects to the power unit. Then select the location of inlet valves on interior walls – about one valve for every 600 – 700 square feet of living space on each level and connect those using vertical tubing to the main trunk line. As far as tools, you’ll need a right angle drill with a hole saw to cut through the sole plate or top plate to run tubing and wire vertically. You’ll also need a PVC tubing cutter and PVC cement to connect the tubing and fittings. If you’re installing a system in an existing home you’ll need a small drywall saw to cut small holes where you will place the inlet valves. We offer our dealers all of the installation materials and tubing cutters to handle the installations. What kind of profit can an integrator expect? What is the payback to the consumer or a builder for putting a system in their home? Electrolux Central Vacuum System builds in a margin of 50 to 53 percent for our systems – power unit and cleaning set. Plus dealers can set installation rates to earn additional margin from their labor. Installation charges typically range from an average of $75 for new homes to $150 for retrofits per inlet valve. That includes the installation materials and labor charges. For both the consumer and builder, the central vacuum system adds value to the home, which means a builder has a high margin upgrade that he can build into the price of a home. The builder also has a competitive advantage over other builders who don’t install central vacs. Consumers can get a better price when they sell their homes or sell them more quickly. But most important, the consumer has a product that will improve the indoor air in their home and make cleaning faster, more thorough and much more convenient. Tell us about the new BEAM Alliance System by Electrolux. How is it different from other central vacs? 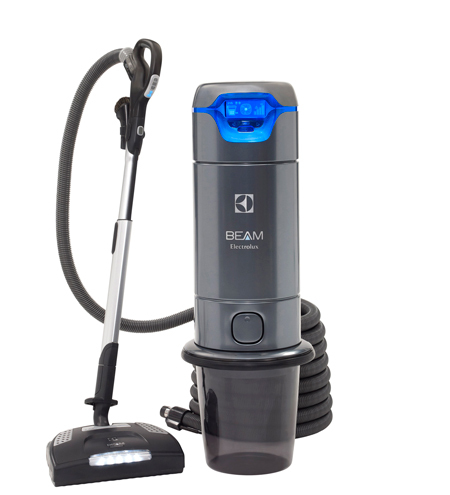 The BEAM Alliance brings technology never before applied to a home cleaning system. It gives the user more control, easy and convenient cleaning and 2-way communication to keep the user informed about the system’s performance and efficiency. Quiet operation means you can clean the home without interrupting other family activities. You not only can hear the phone ring, you can even talk on the phone while cleaning. It also uses less energy and brings a sleek, style that looks like it belongs in an integrator’s showroom as well as a new custom home. Our BEAM Alliance System a motion detector that saves energy, a press and release bucket that makes it easier than ever before to empty the collection receptacle and replace it on the power unit. It has a new handle that is much more comfortable to clean the home and the ability to adjust the power at the hose handle. You can dial down the power for cleaning delicate items like draperies or the vents on home electronics equipment or operate at full power to deep clean floors and upholstery. The BEAM Alliance System has generated tremendous enthusiasm from our dealers and from their customers. Electrolux Central Vacuum System offers our industry’s most comprehensive dealer support programs including co-op advertising, customized literature, model home systems, installation and sales training and more.